With one of my recent used book purchases, 'Hockey's Book of Firsts' by James Duplacey, I've become inspired to post a few 'Did You Know' posts. Maybe not. After all, it's been well over a year since I last posted one. 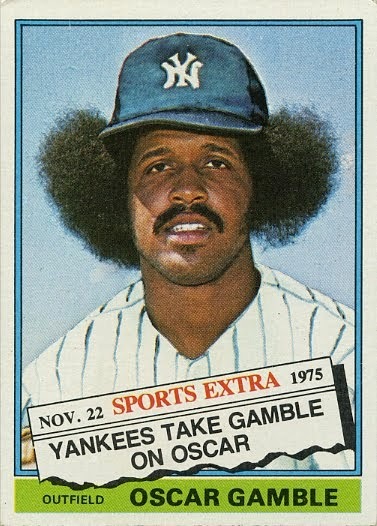 But I loved finding a neat story in the book and then trying to hunt down a card that represented the accomplishment. And if the name Tom Bladon doesn't ring a bell (or what his achievement might be), then this post, and Mr. Duplacey's book, will have served it's purpose. 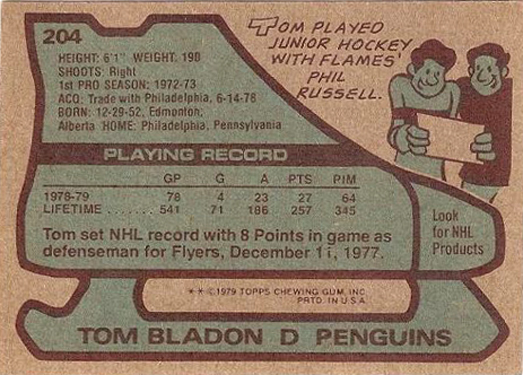 'Did You Know' - Defenceman Tom Bladon was the first rearguard to register 8 points in a game. 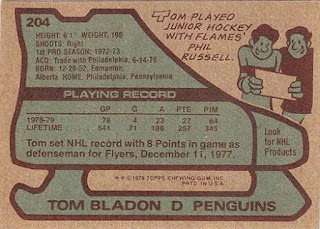 "Tom Bladon had a night for the ages and a slot for the record book on December 11, 1977, when he recorded four goals and added four assists in the Philadelphia Flyers' 11-1 whipping of the Cleveland Barons. Since Bladon finished the season with only 11 goals and 35 points, he collected 25% of his season's output in a single game!" Wow. That's quite a night. Now, why did I show you a Penguins card from a couple years later? You can clearly see the fast fact on the bottom of the card. Card backs can actually house some interesting information if you are looking for it. 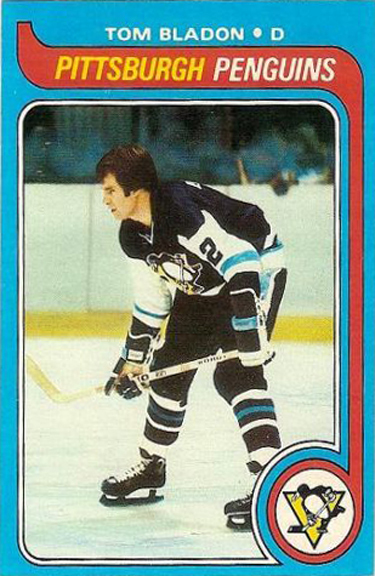 There have only been a handful of players to ever score 8 points in a game (13 to be exact) and Mario Lemieux is the only one to have done it three times (Gretzky did it twice). The majority of these 8-point games came in the 80's when scoring was at an all-time high. That's what makes Bladon's accomplishment even more impressive. Up until he has his historic night, only three players ever....EVER had scored eight in a game. Maurice Richard in the 40's, Bert Olmstead in the 50's and Darryl Sittler's incredible 10-point game in '76. 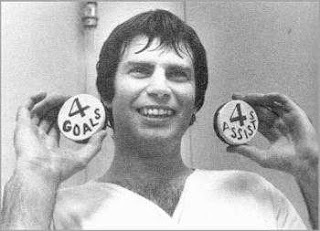 Tom Bladon held the defenceman single game record for almost a decade when Edmonton's Paul Coffey matched the stat on March 14, 1986. They remain the only two D-men to have scored 8 in a game. But there was only one to do it first. note: in doing some additional research, I learned that Bladon was a +10 on the night, a record at the time and one that still stands to this day. So that's like two Did You Know's for the price of one. You're welcome. nice. it was only 23%, but that's me being a math Nazi as usual. Clearly Tom hates math Nazis. I didn't know. Now I do. Thanks for the interesting little tidbit. You are very welcome Marc. Glad you enjoyed the post.